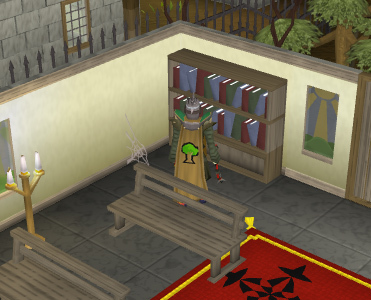 Search a bookcase in Seer's Village Chapel. To start, go to the church just south of the bank in Seer's Village, and search the bookcase, this will initiate the quest. Take the Ragged Book and read it. Use some Soft Clay on the Ragged Book, if you don't have Soft Clay, you can get some clay in the Earth Elemental section of the Elemental Workshop, and fill a bucket with some water at any water source. The closest water source would be the sink to the north. After using the Soft Clay on the Ragged Book, you'll get a Key Mould. 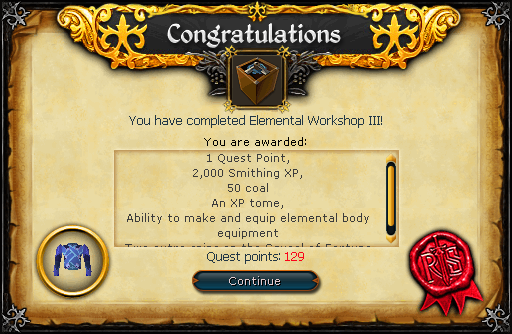 Now head into the Elemental Workshop and kill an Earth Elemental for some Elemental Ore, and make sure you have 4 Coal as well. 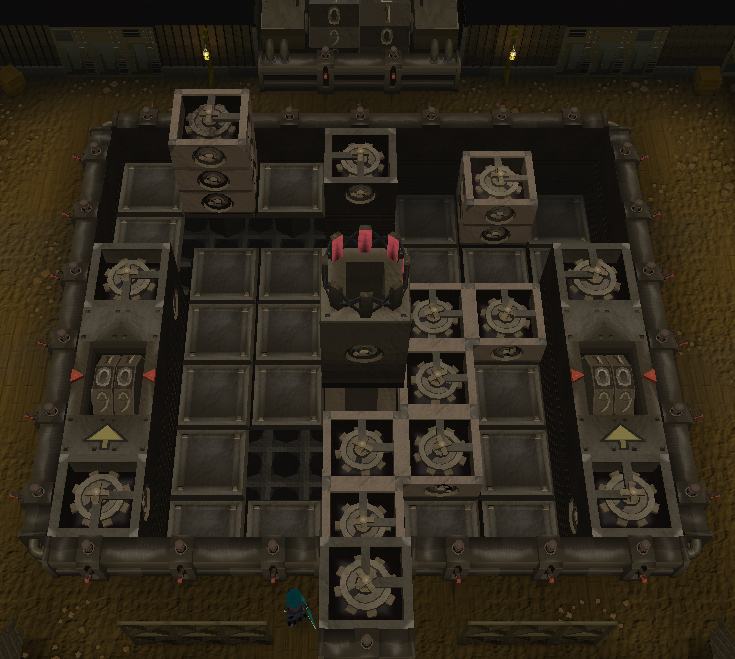 Head into the Fire Elemental room and use your Elemental Ore on the furnace to get an Elemental Bar. 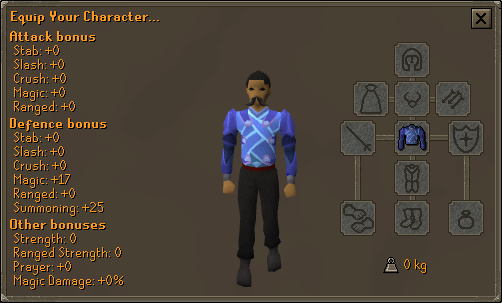 Use the Elemental Bar on the furnace and you'll receive a Ragged Elemental Key. 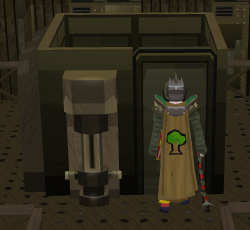 Go into the Elemental Workshop using your Battered Key, if you don't have a Battered Key, you can get one by searching the bookcase in the house just south of the Elemental Workshop. Read the book you find and you'll get a Battered Key. Head down the hatch, then down the stairs and go down to the Body Door. 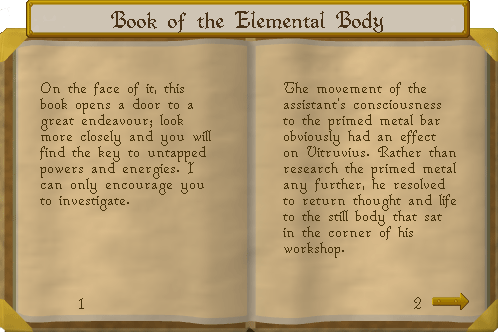 Open it with your newly obtained key, and you'll find yourself in a new section of the Elemental Workshop. The room inside is locked, and to unlock it you'll need put a Primed Bar in the slot. 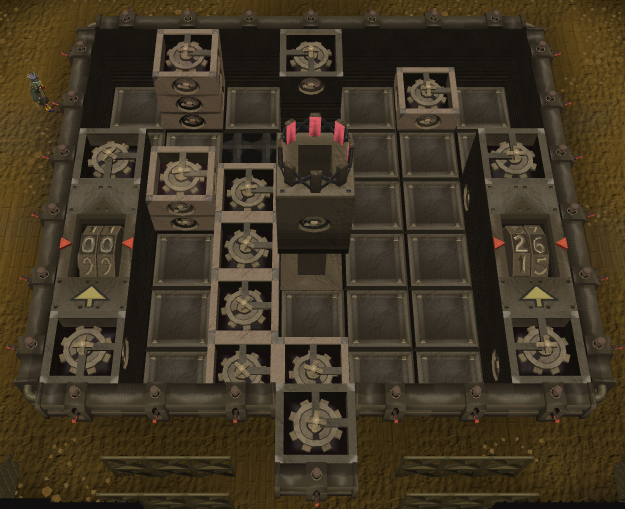 To get a Primed Bar, make an Elemental Bar, then go to the 2nd floor of the Elemental Workshop and put it on the jig cart, then take it through each section to make it, just like you did in Elemental Workshop II. Make another Primed Bar, as you'll need it later. 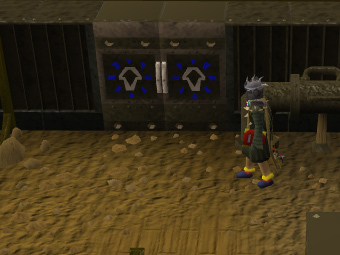 Put the Primed Bar you have into the slot and the door will open. Now that that's out of the way it's time to do the puzzle downstairs. The levers push the squares. They are working like crowbars, levering the squares into the empty spaces. You can move individual squares or whole rows like this. In the top, left-hand corner of your screen is a magnifying glass. If you press this, you'll get a birds eye view of all but the square behind the middle tower. I found it easier to work using this view. You only have 50 moves to complete each section, unless you power up some bonus moves. 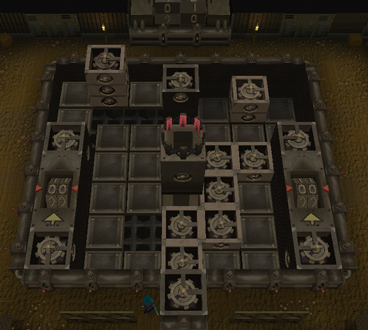 There is only the first puzzle where you can't release bonus moves. The power is coming from the generator to the east (ie the bottom of your screen in the bird's eye view). 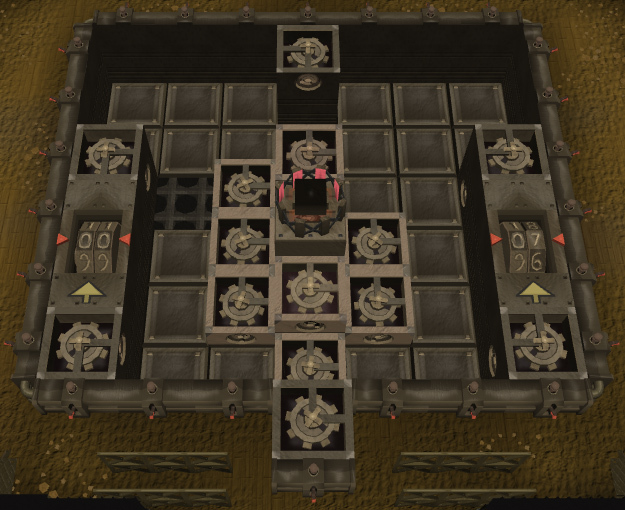 Every position will have to link to this power generator. 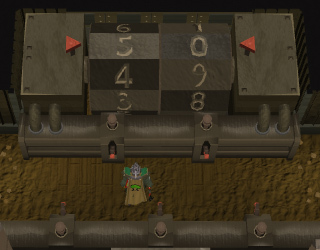 Bonus 50 moves: Stick a small block in front of the power generator. Line up another to the north of it (right of it in your birds eye view); then place the 2 storey block to the north of that (right of that). 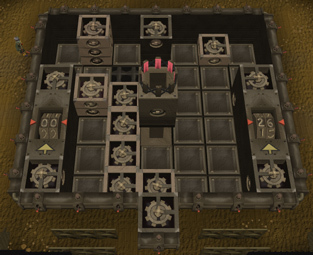 This links up with the hole at the north-eastern side (far right-hand corner) and gives you 50 bonus moves. 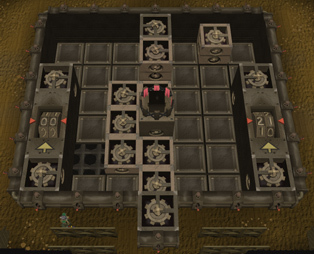 You can only do this after you've released the 2 storey block with the completion of puzzle 1. 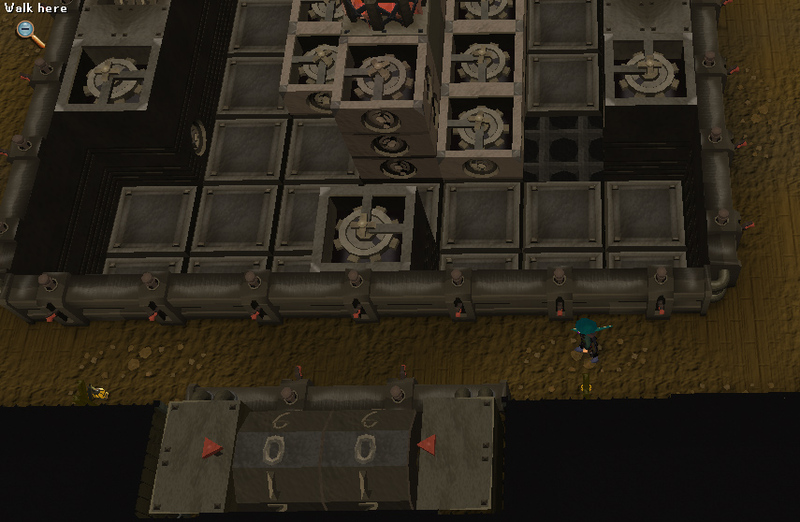 Bonus infinite moves: Stick a small block in front of the power generator. Line up another to the south of it (left of it in your birds eye view); then place the 3 storey block to the south of that (left of that). This links up with the hole at the south-eastern side (far left-hand corner) and causes the counter to jam. It'll jam on 62 moves and won't budge, even when you move the blocks. That gives you infinite amount of moves from here on. You can only do this after you've released the 3 storey block with the completion of puzzle 2. While puzzles 1 and 2 end with cut-scenes, you'll get nothing for the completion of puzzle 3. You may get a message suggesting that you power the machine up. Ignore the message and carry on to position 4. You should see the tower start noticeably spinning. If that doesn't happen, then rearrange everything into position 3 again, then back to position 4. The second time, it should definitely start spinning. At this point, you will see no cut-scene to alert you to the fact that the third part of the puzzle is complete. Instead you will receive a message suggesting that you need to power the machine. Just continue to position 4, ensuring that the 3 storey and 2 storey blocks are in the correct positions. After this, the central block will start spinning in the air. This is very noticeable, with graphics and sounds. If it does not do this, then repeat position 3 and position 4 again. This will surely unlock it upon repetition. After solving solution four, you only need to move the 3 storey tower North, and the blocks on the Eastern side into the middle. 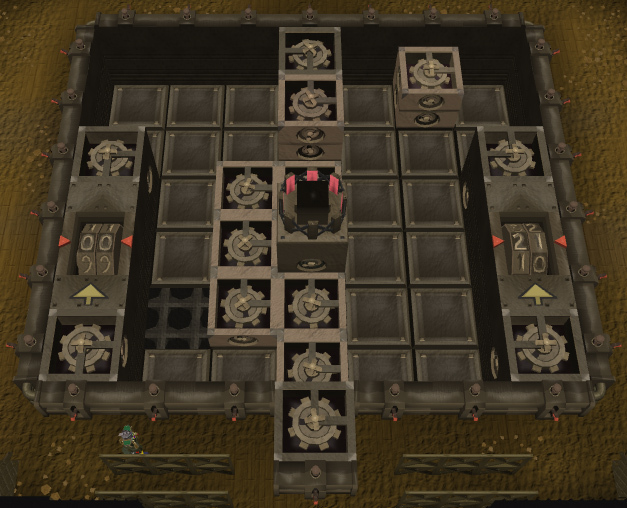 You should not need to reset the puzzle anymore. Once you're finished with the puzzle go back upstairs and go inside the room, flip the lever so the door closes, then push the big red button. The Primed Bar in the slot will turn into a Body Bar, take it. Now put another Primed Bar into the slot. Go downstairs and have the machine go back down so you can power it back up. After it's powered back up, move the mechanisms so it goes back up into the house. Upstairs and make yourself another Body Bar. 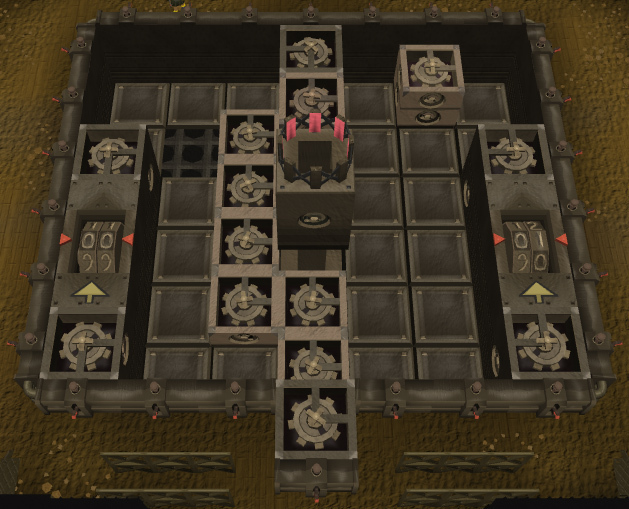 Go upstairs to the workbenches on the 1st floor of the Elemental Workshop and use a Body Bar on one of the workbenches to make a Body Body. 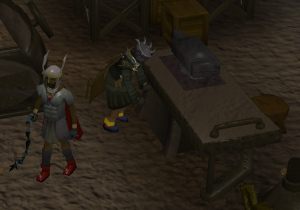 [^] Search the bookcase in the Seer's Village Church. [^] Use Soft Clay on the Ragged Book to get a Key Mould. [^] Use an Elemental Bar on the Elemental Workshop furnace to get a Ragged Elemental Key. 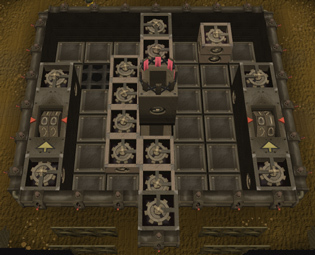 [^] Go down 2 floors in the Elemental Workshop and open the Body Door. [^] Use a Primed Bar on the slot to open the door. [^] Solve the first puzzle. [^] Solve the second puzzle. [^] Solve the third puzzle. [^] Solve the fourth puzzle. [^] Solve the fifth puzzle. [^] Go upstairs to the room and flip the lever, then push the big red button. [^] Take the Body Bar, and put another Primed Bar into the slot. [^] Do puzzles 3, 4, and 5 again. [^] Take the Body Bar, go up 2 floors to the workbenches. [^] Use a Body Bar on the workbench to make a Body Body.